A major attraction in the museum is the Tibbals Learning Center with a myriad of posters that were used to broadcast that the circus was coming to town. The key attribute in the museum is The Howard Bros. Circus Model, the world’s largest miniature circus created by the master model builder and philanthropist, Howard Tibbals; a task that took him 50 years to finish to perfection. Not only does The Tibbals display commemorates to celebrate former circus performers but also affords visitors of all ages the thrill of sensing the center ring. 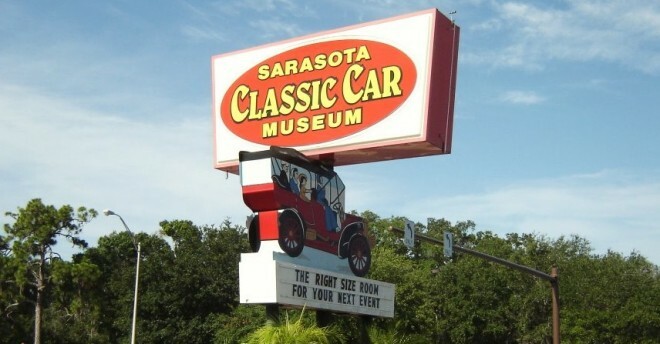 One of the best attraction values in Sarasota is the Sarasota Classic Car Museum distinguished as the second oldest operating antique car museum in the country. This is the mecca of man’s automotive genius with rotating exhibits of antique, classic and European automobile collections throughout the Museum. Alfa Romeo, Bentley, Cadillac, DeLorean, Edsel and Ferrari features as some of the foremost automobile manufacturers with their craftsmanship on display in the museum. Visitors have the privilege to admire collectors items such as a dragster belonging to Don Garlits, Paul McCartney’s adored Mini Cooper and John Lennon’s 1965 Mercedes Benz. The museum is a 190 acre wildlife sanctuary which introduces visitors to the old Myakka area and the notable Crowley family. It serves as an educational facility and promotes environmental awareness with 5 native Florida habitats. Pioneer history buildings from the 18th century and a museum with historic objects on exhibition are some of the focal attractions. Very popular is the restored Tatum House, the pioneer cabin, the blacksmith shop and the working sugar cane mill. 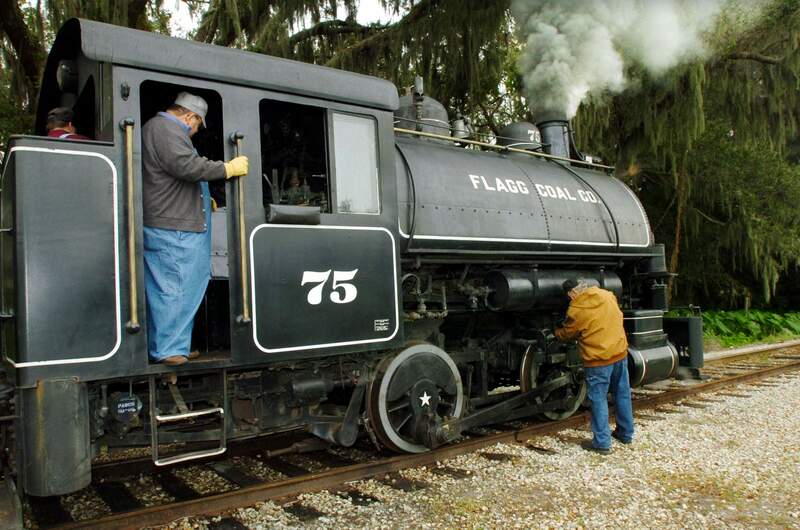 The Florida Railroad Museum has achieved their goal and that is to let visitors “Ride The Exhibits” by the keeping of distinctive examples of railroad rolling stock which served Florida and its railroads in the 1940’s and 50’s. Visitors can take pleasure in real live operations of trains, collected locomotives and cars at the museum. Themed train rides are scheduled throughout the year and the caboose is available for chartering for large corporate events or smaller parties. Operations take place from the train station in Parrish where artifacts, memorabilia and exhibits of historic value are on display. Discover a fascinating 30-acre historical, archaeological and environmental museum. Experience prehistory by stepping inside “A Window to the Past,” an archaeology exhibition about the gulf coast region’s earliest people. On the vanguard of cultural development was John Ringling, the prominent circus magnate who spent many of his winters in Sarasota and who established art and culture in this area when he built the John and Mable Ringling Museum to exhibit a personal collection of masterpieces. The museum was lodged on a former estate on the shore of Sarasota Bay owned by John. Today the museum attributes sculptures and paintings by the great Old Masters showing off Gainsborough, El Greco, Veronese, Tintoretto, Titian, Veláquez, Van Dyck and Rubens. It is a bastion of treasures with Asian, American and European works of genius. It was in 1925 when John involved architect John H. Phillips to design the museum. Construction of the museum was hurdled by the collapse of Florida’s land boom and Wall Street Stock Market crash around 1927. The passing away of John’s beloved wife, Mable and the financial hardship however did not impede John’s dream and he borrowed money to complete the museum to prolong the memory of his darling Mable. 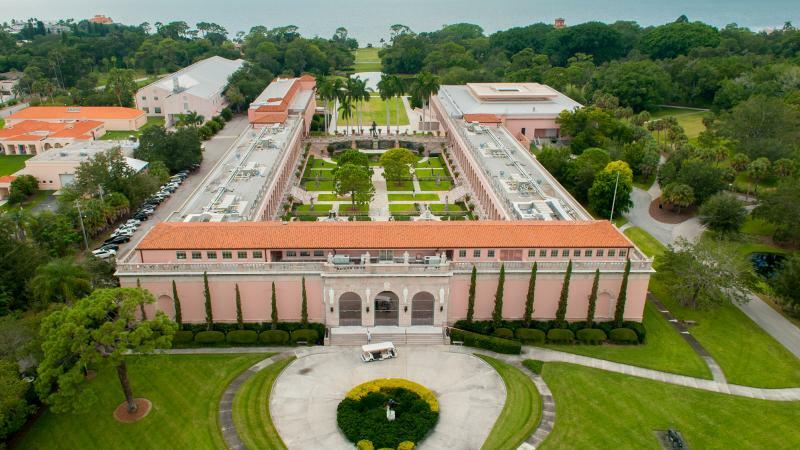 “The John and Mable Ringling Museum of Art” was officially opened to the public in October of 1931. Mable and John found delight in sharing and cultivating their interest in travel, art and culture; especially there love of things Italian. Today Sarasota can be fortunate that the couple chose to build here two monuments to their fascination and interest; The John and Mable Ringling Museum of Art and the couple’s first project, The Cá d’Zan (“House of John”), their splendid Venetian Gothic mansion. The Courtyard of the Museum of Art is awe-inspiring with casts of original renaissance sculptures and antiquities. The soaring David by Michelangelo stands out as a testimony. Two imposing fountains, The Fountain of Tortoises and The Oceanus Fountain salute visitors. A combined collection gift, building and donation n 2006 from the prominent Asian art collector, Dr. Helga Wall-Apelt boasts the Asian art initiative of the Ringling Museum and acknowledges the museum as a key venue in Florida for the study of Asian Art. The Ulla R. and Arthur F. Searing Wing opened in 2007 and contribute special exhibitions and expansive exhibit space for major traveling shows. In 2011 Ringling’s Museum was boosted by a $2,9 million Skyspace, the largest one of only two Skyscape installations on the East Coast of the United States. In December 2011 Selby’s Courtyard was crested with a concrete and steel canopy to frame a 24 ft. by 24 ft. aperture to the sky. Artist James Turrell and his team was the master architects behind this spectacular Skyspace creation. 56 Viewers at a time can view from tilted benches beyond the large oculus and marvel at the changing Florida skies. The structure’s lighting system with a uniquely fused chain of colored LED lights is supported by a central colonnade. The words of Matthew McLendon, curator of Ringling’s modern and contemporary art describes it all: “It’s a space that distills and concentrates experience”. The Marie Selby Botanical Gardens is a not-for-profit institution fostering understanding and appreciation of tropical plants through programs of research, conservation, education and display. It is perhaps best known for its living collection of more than 6,000 orchids. The 9.5-acre bayfront property is an open-air and under-glass museum of more than 20,000 colorful plants. Mote Marine specializes in marine life research, education, aquaculture and marine mammal and sea turtle rescue and rehabilitation. It also has an aquarium, displaying mostly native Floridian marine life from a variety of environments. My kids really love Mote Marine, especially the sharks. Powel Crosley Estate appears on the National Register of Historic Places and was built in 1929 for Powel Crosley’s wife, Gwendolyn. This elaborate mansion features a circular tower and an adjacent carriage house in a Mediterranean revival-style structure that sits on 16 acres on Sarasota Bay. With 21 rooms and 10 baths the estate encompasses modern amenities for the comfortable hosting of meetings, weddings and diverse social events. Powell Crosley is notorious for his innovation and transforming skills in the industrial world and was responsible for many inventions such as the first automobile, push-button and most powerful radio station, the Shelvador refrigerator, 35mm cameras, the first 4-wheel disc brakes and the first mass produced small economy car. Sarasota Jungle Gardens features 10 acres of lush tropical vegetation, winding jungle trails and entertaining, educational bird and reptile shows twice daily. It is one of the oldest continuously operating attractions in the State of Florida. Open to the public in December of 1940, the “Gardens” has retained its old Florida charm and very little has changed over the past sixty-eight years. Siesta Key is the most popular beach in Sarasota, Florida. It is consistently rated as one of the prettiest beaches in the world. The sand is quartz and has a powdery texture that feels nice and cool under your feet. On its busiest weekends you'll find more than 15,000 people there. Amenities include a concession stand, restrooms, volleyball nets, tennis courts and year-round lifeguards. Pine trees shade an area for picnicking, with grills for cooking out and a playground for the children. This sparkling white beach is also within walking distance to Siesta Village, a shopping and dining mecca with an island flair. The beaches in Sarasota, Florida attract people from all over the world. 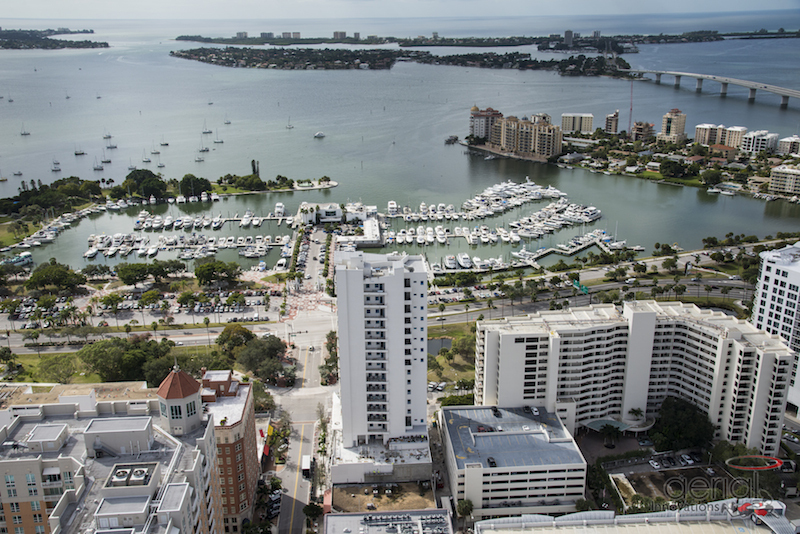 Sarasota and Manatee counties offer roughly 35 miles of beach. Some of the beaches include Anna Maria Bayfront Park, Siesta Key, Lido Key, Longboat Key, Cortez, Coquina, Casperson, Manasota, Venice and Nokomis. The South Florida Science Museum is the biggest cultural and natural history museum on the Gulf Coast of Florida. The museum construes the era from the Pleistocene to the present and visitors can relive this era with exhibits of life-sized casts of Ice Age mammals and fossils. The museum is also house to the popular Bishop Planetarium that presents daily shows on a diverse range of scientific topics. Laser concerts are one of the popular rendezvous in the planetarium. The planetarium boasts one of the most sophisticated projection systems in the world which introduces visitors to a remarkable astronomy education and engaging voyages to the far ends of the universe. The Parker Manatee Aquarium in the facility is a favorite attraction and is home to Snooty, the manatee, the very famed resident of Manatee County. The aquarium works closely with US Fish and Wildlife and critical care hospitals to offer rehabilitation and treatment for manatees before they are released back into the wild.